Ganesh Chaturthi is a very famous and colorful festival of India. It is more commonly and grandly celebrated in Northern parts of the country. If you are looking for a colorful time to visit India, this is the best festival to choose. Ganesh Chaturthi or Vinayak Chaturthi marks the birthday of the Elephant Headed God, Lord Ganesh. It is celebrated in different manners throughout the country. Tourists are more than welcome to be a part of this celebration, with no regards to the religion, creed or culture. According to legends, Goddess Parvati made a son out of turmeric to guard her palace, while she bathed. Lord Shiva, the destroyer who came looking for his wife Parvati was furious when a young boy stopped him from entering the palace. Enraged, Shiva beheaded the boy, which angered Parvati. To pacify Parvati, who was enraged to destroy the Earth, Shiva assured her that he would bring back the boy to life. He sent Lord Brahma to look for any creature sleeping with its head to the north and behead it. Lord Brahma came with the head of an elephant. As promised, Shiva gave life to the boy after attaching the elephant head to the body. The boy was then called as Ganapati (the ruler of all beings) or Ganesh. This birthday of Lord Ganesh is celebrated as Ganesh Chaturthi. The exact date of the festival changes from year to year and it is celebrated in accordance to the Lunar Calendar. The festival fall in late August or first week of September. It falls for the fourth day after new moon. The festival starts on the fourth day and is celebrated for 11 days. The main festival and celebration takes place on the eleventh day. 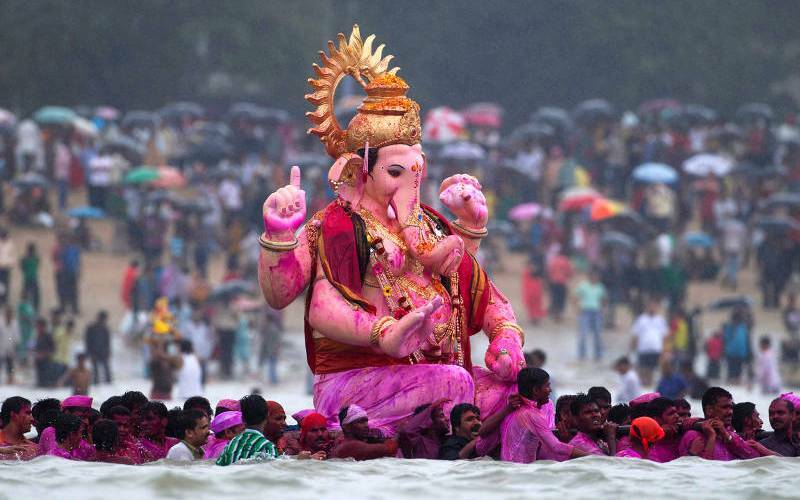 Where Ganesh Chaturthi is celebrated? The festival is very common in Maharashtra. 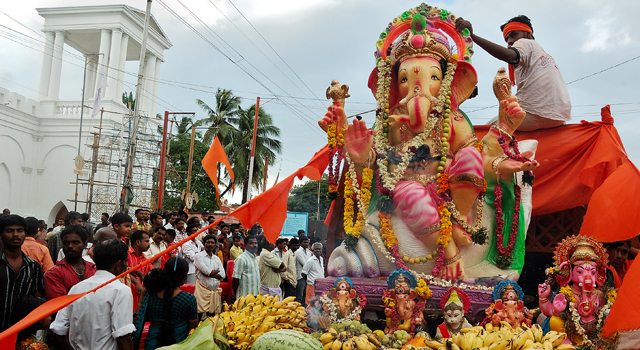 Apart from Maharashtra, the festival is also celebrated in Tamil Nadu, Andhra Pradesh, Karnataka and Goa. Mumbai is the iconic place to visit to enjoy this festival. Main celebrations take place in Siddhivinayak temple located in the Prabhadevi suburb. Apart from this, numerous Ganesh statues will be erected at various parts of the city, for rituals. 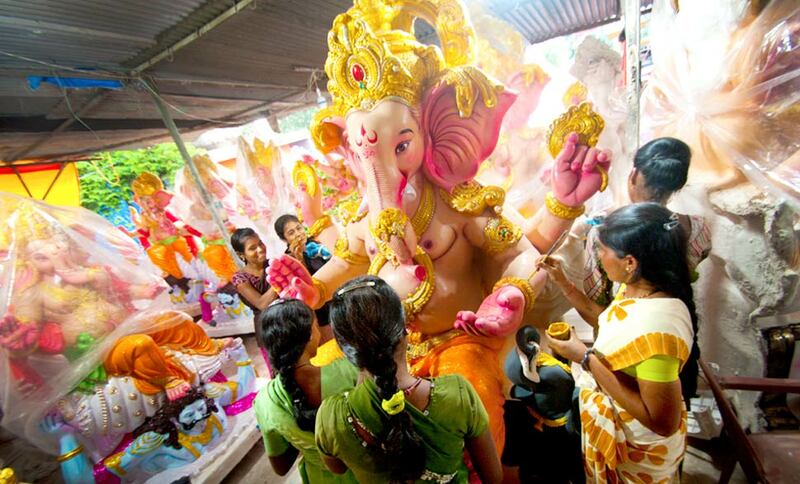 On the fourth day after new moon, people create Ganesh statue out of clay or buy from store. You can find huge statues of the deity throughout the city. On the first night, it is considered as a bad omen to look at the moon. On the first day, Moon God looked down from the sky and laughed at Lord Ganesh, when he fell from his rat. Moon was later punished for his action. For the next ten days, people perform rituals, prayers and offerings to the deity. On the eleventh day, after the morning prayers and rituals, the statue is taken to the nearby water source (preferably the Arabian Sea) and immersed to be dissolved. The procession that takes place to reach the water source is a spectacular one. You can find many cultural activities happening during the procession. 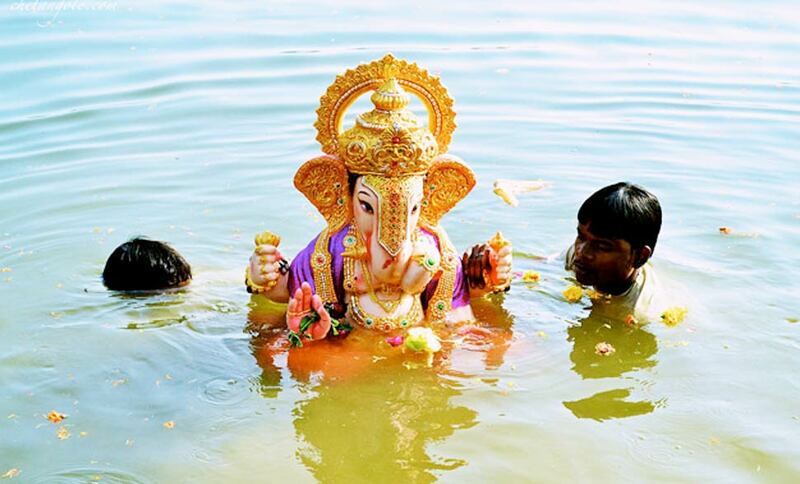 In Mumbai, every year more than 150 thousand statues are immersed into water. By immersing into the water and dissolving it, it is said that the concept of God being omnipresent and figure-less is indicated. For the eleven days, the statue is offered with sweets, coconut, flowers and fruits. Special group prayers, dance and music performances and rituals take place during these eleven days. You can also find recitals of the legend and other religious activities. Also read – Why Mumbai is called as City of Dreams ? You can find many tents on the roadsides that houses large Ganesh statues. Tourists are free to enter, watch rituals, take part in the celebrations and enjoy delicacies served. You can also take part in the procession, where you can watch music celebration, dance performances, ritual chanting and much more. Although the entire city will be immersed in the celebration, here are the top places to visit during the festival. Lalbaugha Raja – This is the place you can find the largest statue of the city. You can find many cultural performances that are conducted throughout the city during this festival. Many Bollywood movies make to the silver screen during this festival. If desired, you can watch a local movie. Puran Poli – A sweet bread made with coconut and jaggery filling. Srikhand – A sour sweet yogurt made with cardamom, yogurt, saffron and fruits. Karanji – Fried pastry made with almonds, cashews, coconut and others. Do not shame, tease or act in anyway, the local would feel insulted. Leave your footwear outside the tent or mandala, before entering it. Cigarettes, liquor and non-vegetarian dishes are not allowed near or in the places of the ritual. If you are not allowed inside a religious event, do not worry. There are numerous mandalas and sites of rituals to choose. Temples will be quite crowded during this festival. You should be ready to stand for several hours in queue. It is better to bring water, with you. If you wish to take part in the procession and immerse the idol in the sea, you can find many stores that sell clay statues of the deity. Most of the roads will be blocked due to the procession and traffic jam is quite common. If you are planning to be somewhere on the eleventh day, plan as early as possible. If you are planning to visit Mumbai during this festival, pre-book tickets and other amenities as early as possible. Numerous tourists and locals visit Mumbai for this festival, crowding transportation and hotels.